Will the real Steph Curry please stand up? Let the official worrying begin. One game could be written off as a fluke, but last night’s contest was a virtual carbon copy of Game 2. The Grizzlies’ swarming defense forced the Warriors into bad shots and turnovers, Stephen Curry continued to be off his game after winning the MVP award, and the Dubs as a whole looked confused and overwhelmed. To their credit, after being down 15 at the end of 3, they battled back and got it to within 4 with about three minutes left. Draymond Green went coast-to-coast for a layup that would have cut the lead to two, but couldn’t get the shot to go down. Courtney Lee hit a three at the other end, and that was that. The first half was just plain miserable. A self-hating Warriors fan two stools down from me at Sidelines wouldn’t shut up about how bad the team was sucking, and while he wasn’t exactly wrong, I can’t stand that kind of negativity in my space. At halftime we relocated around the corner to Tomo, where we had sake and Japanese food and watched the rest of the game in peace. It was actually fairly entertaining, just didn’t have the right result. The Dubs face their first honest-to-god must-win game of the season tomorrow night in Memphis. Win that one, and they tie the series at 2-2 and get home court advantage back. Lose it and they go down 3-1, which is pretty much a death sentence. There’s not much to say about this; either they will or they won’t. Game time is 6:30, be there or be square. 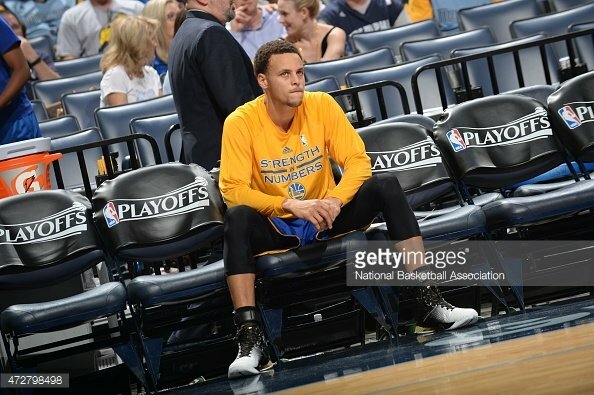 This entry was posted	on Sunday, May 10th, 2015 at 12:10 pm	and is filed under Golden (State) Years. You can follow any responses to this entry through the RSS 2.0 feed. You can leave a response, or trackback from your own site.